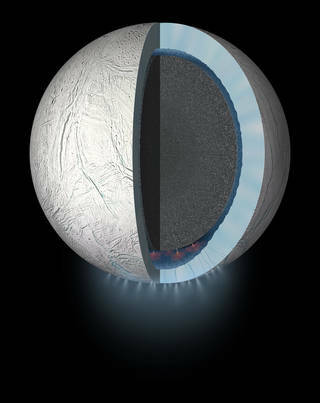 October 26, 2015 – NASA’s Cassini spacecraft will sample the ocean of Saturn’s moon Enceladus on Wednesday, October 28, when it flies through the moon’s plume of icy spray. Cassini launched in 1997 and entered orbit around Saturn in 2004. Since then, it has been studying the huge planet, its rings and its magnetic field. Cassini is scheduled to make a close flyby of Enceladus on Wednesday, in the mission’s deepest-ever dive through the moon’s active plume of icy material. The spacecraft will pass a mere 30 miles (49 kilometers) above the moon’s surface. Cassini scientists are hopeful the flyby will provide insights about how much hydrothermal activity — that is, chemistry involving rock and hot water — is occurring within Enceladus. This activity could have important implications for the potential habitability of the ocean for simple forms of life. The critical measurement for these questions is the detection of molecular hydrogen by the spacecraft. The flyby will help solve the mystery of whether the plume is composed of column-like, individual jets, or sinuous, icy curtain eruptions — or a combination of both. The answer would make clearer how material is getting to the surface from the ocean below.